There will be less of the Winchester brothers next season on The CW as the network has cut the episode order of “Supernatural” season 14. The CW Renews 7 Shows For 2017-2018 Season – ‘Arrow,’ ‘The Flash,’ ‘Supergirl’ & More! 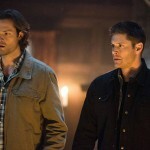 “Supernatural” is rocking it out in the upcoming season. The show announced it has cast Rick Springfield in the role of Lucifer’s minion. The actor is set to appear in several episodes.